Books \ Non-Fiction \ Food & Drink \ BBQ More! Cook your entire dinner on the grill! In this new smoking hot barbecue book, you will learn far more than just grilling a piece of meat to perfection. 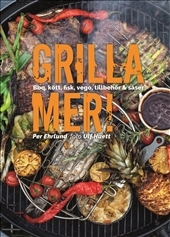 The book also contains vegetable dishes, classics like beer can chicken, smokey casseroles, Louisiana inspired sauces and much more – and you can make it all on your grill! So gather around the fire, put on some music and get everything that everything that you like on the grill. Everything can be barbecued, and combined any way you want, it’s all up to you!